NORFOLK, England -- Social media are going frenzy after a Russian Air Force Tu-214R was spotted and tracked on the Internet, by means of its ADS-B transponder signals detected by Flightradar24 collecting stations, as it flew from Kazan to Crimea and back, closely following the border between Russia and Ukraine on Jun. 18. Built by the Kazan Aircraft Production Association’s (KAPO) and flown from the company’s airfield, the Tu-214R registered RA-64514, serial number 42305014, is the second of the two examples of this kind of aircraft built under contract with Russia’s Ministry of Defense. The Tu-214R is a Russian ISR (Intelligence Surveillance Reconnaissance) aircraft. It is equipped with all-weather radar systems and electro optical sensors that produce photo-like imagery of a large parts of the ground: these images are then used to identify and map the position of the enemy forces, even if these are camouflaged or hidden. Furthermore the aircraft is known to carry sensor packages to perform ELINT (Electronic Intelligence) and SIGINT (Signal Intelligence) missions: the antennae of the Tu-214R can intercept the signals emitted by the enemy systems (radars, aircraft, radios, combat vehicles, mobile phones etc) so as it can build the EOB (Electronic Order of Battle) of the enemy forces: where the enemy forces are operating, what kind of equipment they are using and, by eavesdropping into their radio/phone communications, what they are doing and what will be their next move. This kind of aircraft usually operate in this way: it either loiters/circles in a friendly or uncontested airspace at high altitude and at safe distance from the target(s) of interest or along the border of the enemy country. The aircraft is probably not yet operational and the last images published on the Web show that the aircraft was not given the standard white paint color scheme yet. The aircraft features the same types of external bulges of other very well known intelligence gathering planes, as the U.S. RC-135 or the Israeli B-707 with the Phalcon system, along with minor differences with the first operative Tu-214R, RA-64511, serial number 42305011. What the spy plane was doing along the border is difficult to say, even though it’s quite likely that it was testing some of its onboard sensor packages against real targets….those located in eastern Ukraine. 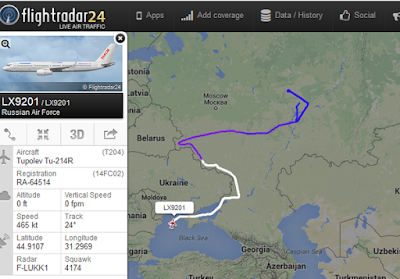 This is not the first time a Russian Air Force special mission aircraft appears on Flightradar24.com. Putin’s doomsday planes can often be tracked on the Internet.